Everybody loves ice cream cake, be it a youngster, old geezer (though they shouldn’t eat too much, right? ), or sneaky raccoon. For vegans, ice cream cake is pretty hard to come by… the only retailer I know of that has prepared ones is Klein’s… and that’s all the way in Brooklyn (though I have almost caved in and gone there!)! 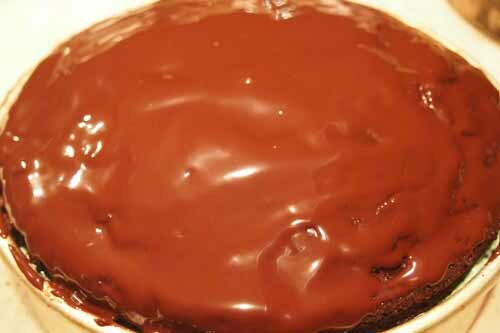 This cake is a mixture of two recipes: I used the Lower Fat Deep Chocolate Bundt Cake recipe from Veganomicon in conjunction with the Ice Cream Cake Recipe from Babycakes Covers the Classics to yield a delightful chocolate concoction. The chocolate cake uses coffee and applesauce for texture, so it results in a more guilt-free treat. You can use any flavor ice cream for your middle… and if you prefer a vanilla cake, you can make that too, so the possibilities are endless. 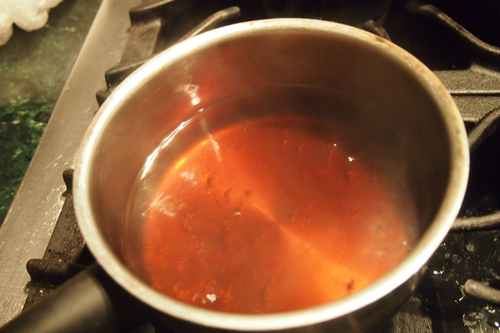 1) Bring the coffee to a simmer in a small saucepan over medium heat. My coffee wasn't exactly black, but my cake turned out good anyway! 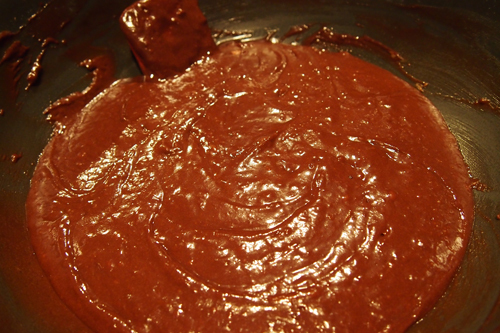 2) Once it is simmering, turn down the heat and whisk in the cocoa powder until it has dissolved. Remove from heat and set aside to bring to room temperature. 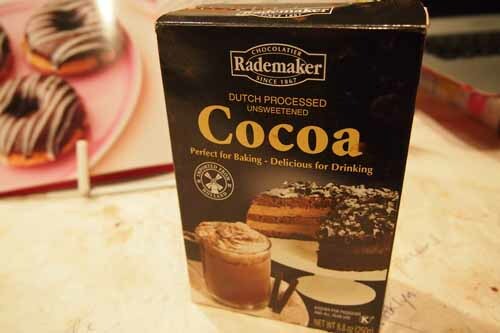 I used this brand in my recipe, and it always yields a smooth chocolatey result. 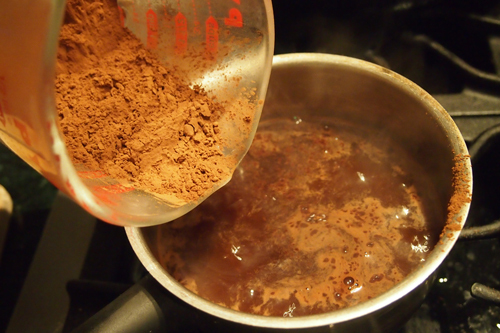 Gradually add the cocoa powder to the coffee, whisking as you go. 3) In a large mixing bowl, whisk together the sugar, oil, applesauce, and cornstarch until dissolved for about 2 minutes. 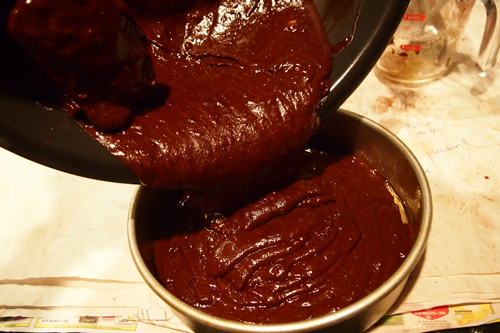 Mix in the extracts, then add the chocolate once it has cooled a bit. 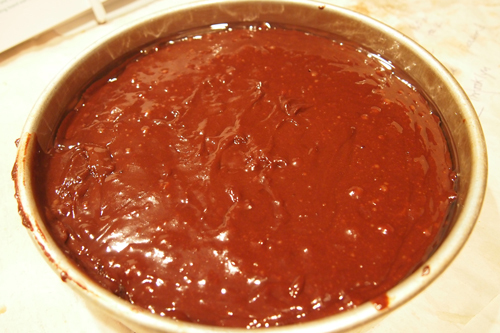 The cake mix before the chocolate is added. Add your coffee/chocolate mix into the sugar/starch mix. 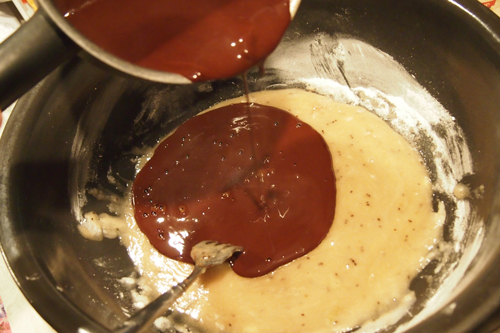 What the batter looks like with the chocolate sauce added. 4) At this time, you should set the oven to 325 degrees. Sift in the flour, baking soda, powder, and salt. Beat until smooth, about 1 minute with a hand mixer or 2 minutes with a whisk. A lump here and there is ok! 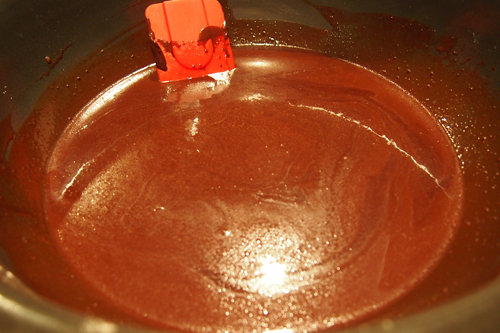 5) Pour the batter into your oiled pan (you can use a Bundt pan or even cupcake tins if you want that instead). I used a 9 inch circle pan for this recipe. Make sure you pour the batter evenly into the pan. Ready to hop in the oven! 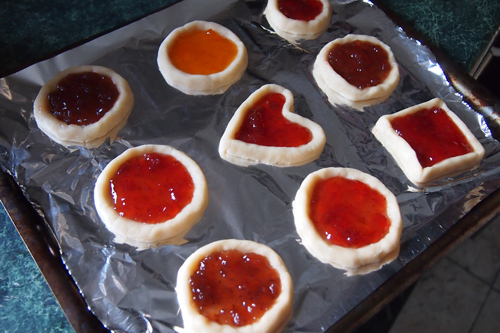 6) Bake in the oven for about 45 minutes… mine took around an hour because I used a slightly denser mold. Do the butter knife check in the center to make sure it has baked all the way through. 7) Let it cool for about a half hour. 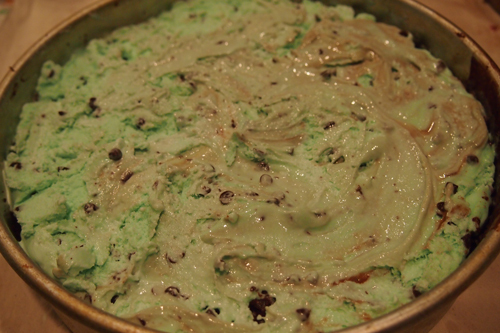 After 20 minutes, take out your ice cream and let it soften for 10 minutes. 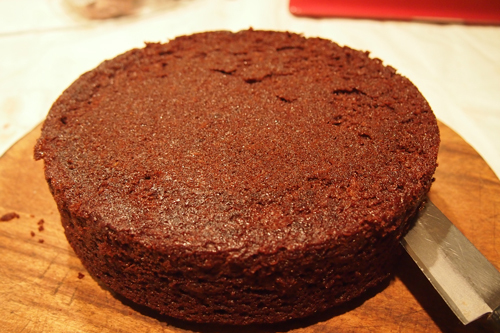 After it has cooled, carefully cut the cake in the center to create two layers. It's important to make two even pieces here. 8) Place the bottom layer back in your pan. 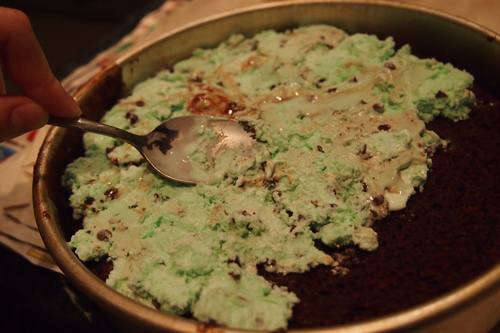 Take your ice cream and spread it evenly over the bottom layer with a spoon or spatula. The less ice cream, the faster it will freeze. Add as much ice cream as you like! Make sure your ice cream layer is consistent and to your desired thickness. 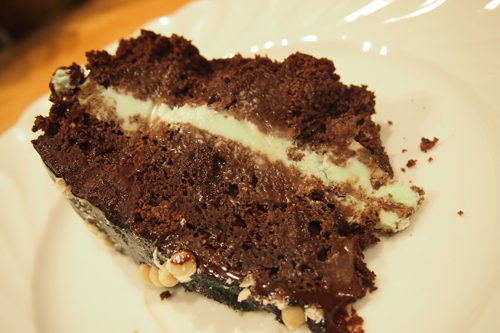 9) Take the top layer of your cake and carefully place it on top of the ice cream. You can be adventurous and put more ice cream on the top, but I choose the safe way and decided to keep it in the middle. Put it in the freezer for now. 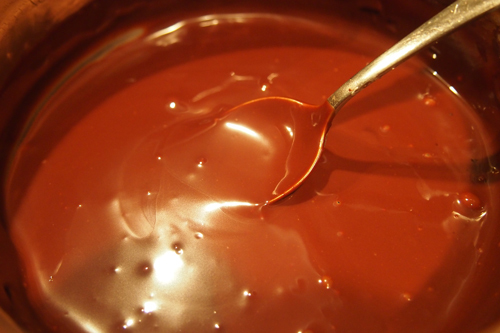 10) Prepare your chocolate sauce topping by melting the chocolate and oil in a double boiler. Let it cool for at least 30 minutes. 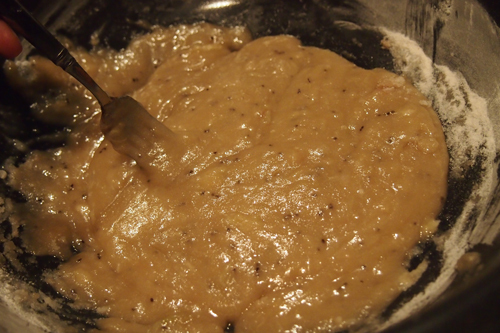 Alternately, you can do as I did and add cocoa and sugar to your leftover coffee, though it makes for a thinner sauce. 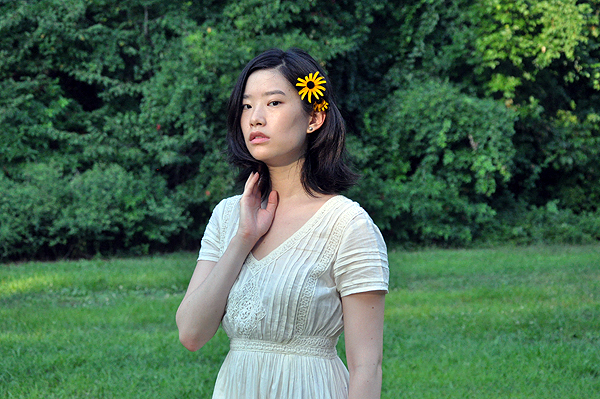 11) It’s time to be adventurous! 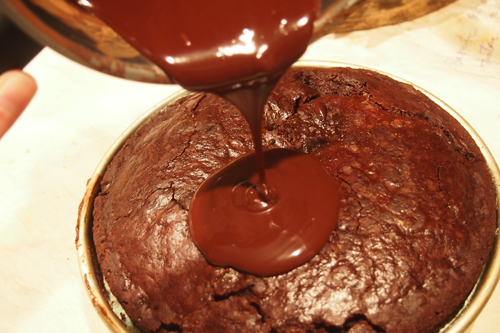 Take the cake out of the freezer and pour your chocolate onto the top of the cake. Spread it on top evenly. I shifted my cake around to let it run down the sides, but you can be less lazy and take it out completely if you prefer (which is a pain to do, it does get stuck to the pan once it is frozen). It's time to get messy! Well, not TOO messy. 12) You can now add colored sugar, sprinkles, chopped nuts or other toppings that would stick to the chocolate. If you don’t care about decorating (which is fine! 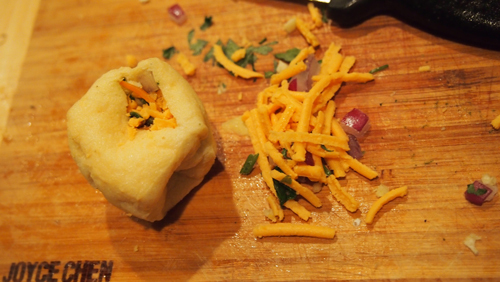 ), pop it in the freezer for at least an hour. I made this cake for my mom’s 54 birthday (happy birthday mommy! 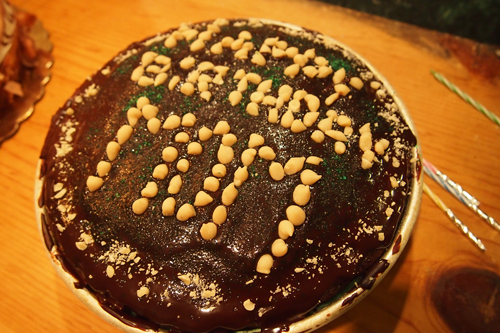 ), so I chose to use white chocolate chips as the lettering, with a green sugar crystal backdrop (sprinkled on the not-yet solid chocolate topping). So delicious and yummily cold! The best part of ice cream cake is its long shelf life. It can be stored for month in the freezer, and will still taste as good as ever. Don’t pig out now! You'll be sure to have dessert for days! 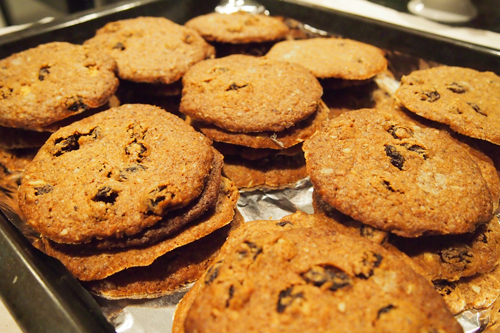 Crispy Oatmeal Raisin Cookies, Oh So Easy! 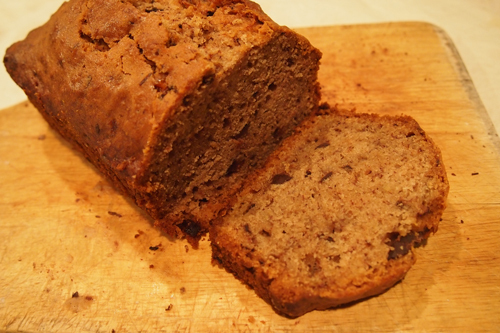 Basic Lite Banana Bread: Nothing to it!